I’m standing in a technicolor courtyard, in front of what appears to be a Far East-inspired temple, and as I vigorously swipe my arms through the air I’m slashing kiwis, melons and bananas as quickly as I can manage. Yes, I’m playing Fruit Ninja. And while I really do feel as though I’m in that courtyard, in front of that temple, surrounded by all that fruit, it’s not because I’ve got an especially active imagination. Rather, I’m playing in virtual reality. Does this game make anyone else crave fruit salad? 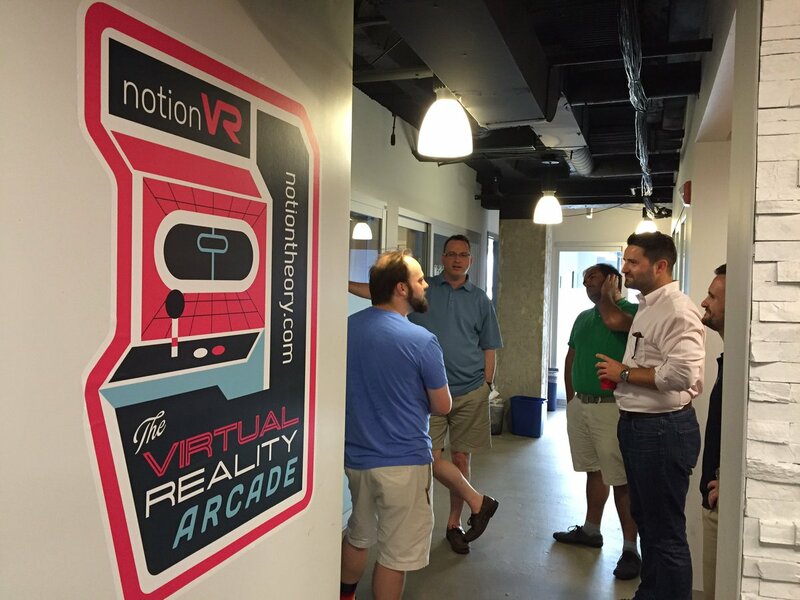 On Wednesday evening, in front of a gathered crowd of #dctech influencers, product development firm NotionTheory unveiled something new: the East Coast’s first (they say) VR arcade. The arcade is a partnership with MakeOffices — the D.C.-born coworking company is hosting all these fun and games in a room at its Dupont Circle location from now through the end of October. Fruit Ninja, while it made a good launch party demo, is far from the only game you can play at notionVR. NotionTheory also has games like Space Pirate Trainer, Ping Pong VR and more available in the space. The team told Technical.ly they’ll be continually updating the game roster to keep the arcade exciting, too. Want to have a go yourself? You can reserve a time slot at notionVR here — the experience will run you $15 for 30 minutes or $30 for an hour, and you can invite as many friends as you’d like. The arcade is open Monday through Friday from 9 a.m. to 7 p.m., but Thursdays from 1 p.m. to 4 p.m. are specifically reserved for MakeOffices members.